Combined, we change the world! THANK YOU FOR MAKING UC DAVIS GIVE DAY A SUCCESS! 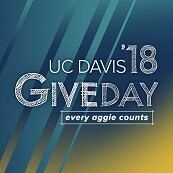 If you still want to support UC Davis Give Day, please click on the button below! Thank you to everyone who gave today! Chancell-ing includes guest coaching with LeShelle at a recent gymnastics meet. Our amazing Athletics programs give our students the opportunity to excel at sports and academics. THANK YOU to our generous donors for helping us reach our goal of 100 gifts! Your support of unrestricted giving to UC Davis is important and appreciated. Thank you to the DCC Cabinet for providing the $30,000 challenge gift! THANK YOU to our generous donors for helping us reach our goal of 10 gifts for this challenge! Your support of student scholarships at UC Davis is important, timely and greatly appreciated. Special thanks to Brian & Kathy Huben for their gift of $5,000 to increase undergraduate scholarship support through the Parent & Family Council Scholarship. Now on to the next goal! THANK YOU to our generous donors for helping us reach the goal of 10 gifts for this challenge and a total of 20 gifts for the Parent & Family Council Scholarship Fund! Because of the support from all, the Parent & Family Council gave a total of $10,000 to support undergraduate students through the Parent & Family Council Scholarship. Thanks to those volunteers - and all of you for giving! We raised a lot of money to support student scholarships today. THANK YOU to our generous donors for helping us reach our goal of 100 gifts! Your support of Women’s Basketball is important and very much appreciated. Thank you to Bob and Cathy Kerr for providing this $30,000 gift and inspiring others to give as well! THANK YOU to our generous donors for helping us reach our goal of 15 gifts! Your support of Student and Alumni Programming Fund is important and very much appreciated. Thank you to Scott and Laurie Carney for providing this $3,000 gift and inspiring others to give as well! We reached our goal of 5 gifts! Thank you to our donors for your generous gifts, and for unlocking $2,500 from Jong L. Chen, M.D. and Shu Chen, M.D. THANK YOU to our generous donors for helping us reach our goal of 25 gifts! Your support of Cancer Center is important and very much appreciated. Thank you to Wayne and Jacque Bartholomew for providing this $25,000 gift and inspiring others to give as well! Thank you! While we didn’t meet our challenge goal together we did make a big difference for the students and faculty in the College of Engineering. College of Engineering Leadership still made their generous gift of $6,000 and your gift was added to that contribution. Thank you for participating in UC Davis Give Day! THANK YOU to our generous donors for helping us reach our goal of 40 gifts! Your support for the Bodega Marine Lab is important and very much appreciated. Thank you to the Bodega Marine Lab Faculty and Staff for providing this $4,150 challenge gift and inspiring others to give as well! We reached our goal of 10 gifts! Thank you to our donors for your generous gifts, and for unlocking $5,000 from Deborah Thompson-Austin and Ron Austin, Jr. THANK YOU to our generous donors for helping us reach our goal of 10 gifts! Your support for the Department of Geology is important and very much appreciated. Thank you to Lori L. Summa, Ph.D. for providing this $5,000 challenge gift and inspiring others to give as well! THANK YOU to our generous donors for helping us reach our goal of 15 gifts! Your support for the School of Law is important and very much appreciated. Thank you to Daniel Ichinaga for providing this $2,500 challenge gift and inspiring others to give to King Hall as well! THANK YOU to our generous donors for helping us reach our goal of 70 gifts! Your support of Cancer research is important and very much appreciated. Thank you to the Farrah Fawcett Foundation for providing this $13,000 gift and inspiring others to give as well! THANK YOU to our generous donors for helping us reach our goal of 10 gifts! Your support of STEP Student Award is important and very much appreciated. Thank you to Arturo and Rosa González for providing this $10,000 gift and inspiring others to give as well! THANK YOU to our generous donors for helping us reach our goal of 5 gifts! Your support for the Veterinary Medical Center Capital Project is very much appreciated. Thank you to the Freed Family for providing this $10,000 challenge gift and inspiring others to give as well! THANK YOU to our generous donors for helping us reach our goal of 15 gifts! Your support for the UC Davis Arboretum and Public Garden is important and very much appreciated. Thank you to Tracey and Marcia for providing this $5,000 challenge gift and inspiring others to give as well! THANK YOU to our generous donors for helping us reach our goal of 25 gifts! Your support of Football Development Fund is important and very much appreciated. Thank you to Bob Warren ’58 for providing this $2,500 gift and inspiring others to give as well! THANK YOU to our generous donors for helping us reach our goal of 50 gifts! Your support of Football Development Fund is important and very much appreciated. Thank you to Wayne and Jacque Bartholomew for providing this $2,500 gift and inspiring others to give as well! We reached our goal of 25 gifts! Thank you to our donors for your generous gifts, and for unlocking $2,500 from Jon Weiner and Kathy Shephard Weiner. THANK YOU to our generous donors for helping us reach our goal of 30 gifts! Your support of Chicanx/Latinx Scholarship is important and very much appreciated. Thank you to the Chicanx/Latinx Alumni Association Board Members Caroline Cabias, Neptaly Aguilera, and Ramon Urbano for for their support and for inspiring others to give! THANK YOU to our generous donors for helping us reach our goal of 20 gifts! Your support of Charlie Bamforth Brewing Science Fund is important and very much appreciated. Thank you to Jane Killebrew, Carlos Alvarez, and John Serbia of the UC Davis Brewing Science Advisory Board for honoring Professor Charlie Bamforth by providing this $13,000 gift and inspiring others to give as well! THANK YOU to our generous donors for helping us reach our goal of 10 gifts! Your support of College of Biological Sciences is important and very much appreciated. Thank you to our anonymous donor for providing this $2,500 gift and inspiring others to give as well! THANK YOU to our generous donors for helping us reach our goal of 5 gifts! Your support for the UC Davis College of Biological Sciences is important and very much appreciated. Thank you to Richard D. Kidd, Ph.D. for providing this $2,500 challenge gift and inspiring others to give as well! THANK YOU to our generous donors for helping us reach our goal of 10 gifts! Your support of UC Davis Eye Center is important and very much appreciated. Thank you to Wayne and Jacque Bartholomew for providing this $10,000 gift and inspiring others to give as well! THANK YOU to our generous donors for helping us reach our goal of 10 gifts! Your support of UC Davis Health and Cardiology is important and very much appreciated. Thank you to Wayne and Jacque Bartholomew for providing this $10,000 gift and inspiring others to give as well! THANK YOU to our generous donors for helping us reach our goal of 15 gifts! Your support for the Floyd Tuition Support Fund is important and very much appreciated by the students at the School of Veterinary Medicine. Thank you to Michael Floyd & Nancy Ehrlich for providing this $25,000 challenge gift and inspiring others to give as well! THANK YOU to our generous donors for helping us reach our goal of 40 gifts! Your support for the Friends of ITS is important and very much appreciated. Thank you to the Berg and Sperling Family for providing this $100,000 challenge gift and inspiring others to give as well! THANK YOU to our generous donors for helping us reach our goal of 20 gifts! Your support for the Joy S. Shinkoskey Series of Noon Concerts is important and very much appreciated. Thank you to Bret T. Hewitt for providing this $5,000 challenge gift and inspiring others to give as well! THANK YOU to our generous donors for helping us reach our goal of 10 gifts! Your support for the Manfred P. Fleischer Undergraduate Honors Research Award is very much appreciated. Thank you to Courtney Linn and Sarah Aikenhead for providing this $2,500 challenge gift and inspiring others to give as well! THANK YOU to our generous donors for helping us reach our goal of 20 gifts! Your support for the Tahoe Environmental Research Center is very much appreciated. Thank you to the Boyd Family Foundation for providing this $7,500 challenge gift and inspiring others to give as well! THANK YOU to our generous donors for helping us reach our goal of 20 gifts! Your support for the School of Law is very much appreciated. Thank you to Beth Inadomi '85 for providing this $5,000 challenge gift and inspiring others to give as well! THANK YOU to our generous donors for helping us reach our goal of 15 gifts! Your support for the School of Law is very much appreciated. Thank you to Bijal Vakil '96 for providing this $2,500 challenge gift and inspiring others to give as well! THANK YOU to our generous donors for helping us reach our goal of 10 gifts! Your support for the Veterinary Medical Teaching Hospital is very much appreciated. Thank you to Katerine Burr for providing this $10,000 challenge gift and inspiring others to give as well! THANK YOU to our generous donors for helping us reach our goal of 75 gifts! Your support of Football Excellence Fund is important and very much appreciated. Thank you to Ron Van De Pol '72 for providing this $2,500 gift and inspiring others to give as well! Thank you! While we didn’t meet our challenge goal together we did make a big difference for the student-athletes and coaches in Football. Scott Barry still made his generous gift of $2,500 and your gift was added to that contribution. Thank you for participating in UC Davis Give Day! THANK YOU to our generous donors for helping us reach our goal of 20 gifts! Your support of Student Scholarships is important and very much appreciated. Thank you to the Cal Aggie Alumni Association Board of Directors for providing this $8,025 gift and inspiring others to give as well! THANK YOU to our generous donors for helping us reach our goal of 50 gifts! Your support of College of Engineering is important and very much appreciated. Thank you to the Dean’s Executive Committee for providing this $12,800 challenge gift and inspiring others to give as well! THANK YOU to our generous donors for helping us reach our goal of 15 gifts! Your support of UC Davis SmartFarm is important and very much appreciated. Thank you to Professor David Slaughter and his wife Susan for providing this $10,000 gift and inspiring others to give as well! THANK YOU to our generous donors for helping us reach our goal of 20 gifts today! Your support of College of Biological Sciences is important and very much appreciated. Thank you to Ron and Diane Smith for providing this $2,500 gift and inspiring others to give as well! THANK YOU to our generous donors for helping us reach our goal of 27 gifts! Your support of College of Biological Sciences is important and very much appreciated. Thank you to Lin Weaver and Family for providing this $5,000 gift and inspiring others to give as well! THANK YOU to our generous donors for helping us reach our goal of 34 gifts! Your support of College of Biological Sciences is important and very much appreciated. Thank you to Lin Weaver for providing this $5,000 gift and inspiring others to give as well! We reached our goal of 8 gifts! Thank you to our donors for your generous gifts, and for unlocking $3,000 from Janet E. Mayhew. We reached our goal of 10 gifts! Thank you to our donors for your generous gifts, and for unlocking $10,600 from The Parker Family Foundation. Thank you! While we didn’t meet our challenge goal together we did make a big difference for the students and faculty in Geology. Roy Shlemon still made his generous gift of $25,000 and your gift was added to that contribution. Thank you for participating in UC Davis Give Day! Thank you! While we didn’t meet our challenge goal together we did make a big difference for the Tahoe Environmental Research Center. Alison and Geoff Edelstein still made their generous gift of $5,000. Thank you for participating in UC Davis Give Day! THANK YOU to our generous donors for helping us reach our goal of 20 gifts! Your support for the School of Law is very much appreciated. Thank you to John McKinsey '99 for providing this $5,000 challenge gift and inspiring others to give as well! THANK YOU to our generous donors for helping us reach our goal of 15 gifts! Your support for the School of Law is very much appreciated. Thank you to Kim Lucia '09 for providing this $2,500 challenge gift and inspiring others to give as well! THANK YOU to our generous donors for helping us reach our goal of 10 gifts! Your support for the Compassionate Care Fund is very much appreciated. Thank you to Kathleen Burr for providing this $10,000 challenge gift and inspiring others to give as well! THANK YOU to our generous donors for helping us reach our goal of 5 gifts! Your support for the Feline Compassionate Care Fund is important and very much appreciated. Thank you to Kevin & Patti Clayton for providing this $7,500 challenge gift and inspiring others to give as well! THANK YOU generous donors for helping us reach our goal of 10 gifts! Your support of unrestricted giving to UC Davis is important and appreciated. Thank you to Jim and Lisa DeSanti for providing the $5,000 challenge gift! Thank you! While we didn’t meet our challenge goal together we did make a big difference for the student-athletes and coaches in Football. Chad and Jenny Sindel made their generous gift of $2,500 and your gift was added to that contribution. Thank you for participating in UC Davis Give Day. Thank you! While we didn’t meet our challenge goal together we did make a big difference for the student-athletes and coaches in Football. Jake Mossawir still made his generous gift of $2,500 and your gift was added to that contribution. Thank you for participating in UC Davis Give Day! THANK YOU to our generous donors for helping us reach our goal of 150 gifts! Your support of Women’s Softball is important and very much appreciated. Thank you to Kathy DeYoung for providing this $2,500 gift and inspiring others to give as well! THANK YOU to our generous donors for helping us reach our goal of 41 gifts! Your support of CBS Dean's Circle is important and very much appreciated. Thank you to Tracey Storer for providing this $5,000 gift and inspiring others to give as well! THANK YOU to our generous donors for helping us reach our goal of 51 gifts! Your support is important and very much appreciated. Thank you to Vicki Moore and Scott Chan for providing this $10,000 gift and inspiring others to give as well! We reached our goal of 61 gifts! Thank you to our donors for your generous gifts, and for unlocking $10,000 from Steve and Tammy Conston. THANK YOU to our generous donors for helping us reach our goal of 10 gifts! Your support for QMAP Research Group General Support is very much appreciated. Thank you to an anonymous donor for providing this $10,000 challenge gift and inspiring others to give as well! THANK YOU to our generous donors for helping us reach our goal of 10 gifts! Your support for the R. Bryan Miller Symposium is very much appreciated. Thank you to Ramin Najafi, Ph.D., Joseph H. Pease, Ph.D. and Sundeep Dugar, Ph.D. for providing this $2,500 challenge gift and inspiring others to give as well! THANK YOU to our generous donors for helping us reach our goal of 50 gifts! Your support of Chemistry Undergraduate Student Support Fund is important and very much appreciated. Thank you to Richard C. Larock, Ph.D. and John Maves for providing this $100,000 gift and inspiring others to give as well! THANK YOU to our generous donors for helping us reach our goal of 10 gifts! Your support for the Guardian Scholars Program is very much appreciated. Thank you to Tim Ainsworth and Karen Leaf for providing this $2,500 challenge gift and inspiring others to give as well! THANK YOU to our generous donors for helping us reach our goal of 5 gifts! Your support for the Koret Shelter Medicine Program is very much appreciated. Thank you to Allan Ginsberg for providing this $4,000 challenge gift and inspiring others to give as well! THANK YOU to our generous donors for helping us reach our goal of 5 gifts! Your support for the Koret Shelter Medicine Program is very much appreciated. Thank you to Bobbie Litzinger for providing this $4,000 challenge gift and inspiring others to give as well! THANK YOU to our generous donors for helping us reach our goal of 50 gifts! Your support of UC Davis Women’s Soccer is important and very much appreciated. Thank you to the Newlin Family for providing this $2,500 gift and inspiring others to give as well! THANK YOU to our generous donors for helping us reach our goal of 50 gifts! Your support of UC Davis Men’s Water Polo is important and very much appreciated. Thank you to Yurii and Catherine Hanley for providing this $2,500 gift and inspiring others to give as well! THANK YOU to our generous donors for helping us reach our goal of 50 gifts! Your support of UC Davis Women's Swimming and Diving is important and very much appreciated. Thank you to Yurii and Catherine Hanley for providing this $2,500 gift and inspiring others to give as well! THANK YOU to our generous donors for helping us reach our goal of 10 gifts! Your support of UC Davis Research and Innovation Fellowship for Agriculture is important and very much appreciated. Thank you to Max and Denise Rothschild for providing this $2,500 gift and inspiring others to give as well! THANK YOU to our generous donors for helping us reach our goal of 73 gifts! Your support of the College of Biological Sciences is important and very much appreciated. Thank you to John Cuppoletti, PhD and Danuta H. Malinowska, PhD for providing this $14,000 gift and inspiring others to give as well! THANK YOU to our generous donors for helping us reach our goal of 87 gifts! Your support of the College of Biological Sciences is important and very much appreciated. Thank you to Barbara Horwitz and John Horowitz for providing this $18,000 gift and inspiring others to give as well! THANK YOU to our generous donors for helping us reach our goal of 10 gifts! Your support for the Student Fashion Show in Design is very much appreciated. Thank you to William and Nancy Roe for providing this $2,500 gift and inspiring others to give as well! We reached our goal of 10 gifts! Thank you to our donors for your generous gifts, and for unlocking $26,500 from Dr. Klea D. Bertakis, Dr. Stylianos V. Spyridakis, Ph.D., Vasilios S. Spyridakis and Dr. Demetrios S. Spyridakis. THANK YOU to our generous donors for helping us reach our goal of 40 gifts! Your support for the School of Law is very much appreciated. Thank you to Gary Solis '71 for providing this $10,000 challenge gift and inspiring others to give as well! THANK YOU to our generous donors for helping us reach our goal of 10 gifts! Your support for the Wildlife Health Center is very much appreciated. Thank you to an anonymous donor for providing this $5,000 challenge gift and inspiring others to give as well! THANK YOU to our generous donors for helping us reach our goal of 25 gifts! Your support of UC Davis Men’s Soccer Development Fund is important and very much appreciated. Thank you to our anonymous donor for providing this $2,500 gift and inspiring others to give as well! THANK YOU to our generous donors for helping us reach our goal of 25 gifts! Your support of UC Davis Men’s Soccer is important and very much appreciated. Thank you to our anonymous donor for providing this $2,500 gift and inspiring others to give as well! THANK YOU to our generous donors for helping us reach our goal of 10 gifts! Your support for McNair Scholars Program is important and very much appreciated. Thank you to the Barrett Caldwell, Ph.D. for providing this $2,500 gift and inspiring others to give as well! THANK YOU to our generous donors for helping us reach our goal of 10 gifts! Your support of The Richard A. McGhee AJI Graduate Scholarship Fund is important and very much appreciated. Thank you to Rudy Haapenen, President, AJI for providing this $94,506.39 gift and inspiring others to give as well! We reached our goal of 15 gifts!! Thank you to our donors for your generous gifts, and for unlocking $3,250 from the Graduate School of Management Alumni Board! The Pantry | Help Fight Food Insecurity! We reached our goal of 25 gifts! Thank you to our donors for your generosity, and for unlocking $5,000 from John and Lesli Chuck and the Soderquist Award. THANK YOU to our generous donors for helping us reach our goal of 10 gifts! Your support of the Museum of Wildlife and Fish Biology is greatly appreciated. Thank you to the generous donor for providing this $5,000 gift and inspiring others to give as well! THANK YOU to our generous donors for helping us reach our goal of 20 gifts! Your support of the Agricultural and Resource Economics Student Support Fund is important and very much appreciated. Thank you to Yolo Federal Credit Union for providing this $5,000 gift and inspiring others to give as well. THANK YOU to our generous donors for helping us reach our goal of 100 gifts! Your support to Softball is important and very much appreciated. Thank you to Mark and Wendi Wegener for providing this $2,500.00 gift and inspiring others to give as well! THANK YOU to our generous donors for helping us reach our goal of 75 gifts! Your support of Women’s Gymnastics is important and very much appreciated. Thank you to our anonymous donor for providing this $5,000 gift and inspiring others to give as well! Thank you! While we didn’t meet our challenge goal together we did make a big difference for students in the College of Letters and Science. Louderback Law Group still made their generous gift of $5,000 and your gift was added to that contribution. Thank you for participating in UC Davis Give Day! THANK YOU to our generous donors for helping us reach our goal of 102 gifts! Your support to the College of Biological Sciences is important and very much appreciated. Thank you to Deborah J. Neff for providing this $25,000 gift and inspiring others to give as well! THANK YOU to our generous donors for helping us reach our goal of 100 gifts! Your support of Baseball is important and very much appreciated. Thank you to Justin Andrade for providing this $2,500 gift and inspiring others to give as well! THANK YOU to our generous donors for helping us reach our goal of 25 gifts! Your support of the Marya Welch Initiative for Women’s Athletics is important and very much appreciated. Thank you to Pam Gill Fisher for providing this $2,500 gift and inspiring others to give as well! We reached our goal of 10 gifts! Thank you to our donors for your generousity and for unlocking $5,000 from Dory Shaw Ford and Brian Ford. THANK YOU to our generous donors for helping us reach our goal of 15 gifts! Your support is important and very much appreciated. Thank you to the Peter and Myrna Hays Family for providing this $10,000 challenge gift and inspiring others to give as well! THANK YOU to our generous donors for helping us reach our goal of 10 gifts! Your support of the College of Agricultural and Environmental Sciences Experimental Learning Fund is important and very much appreciated. Thank you to Kamaljeet and Ravinder Khaira for providing this $7,500 gift and inspiring others to give as well! THANK YOU to our generous donors for helping us reach our goal of 10 gifts! Your support of the Ted Bradshaw Engaged Student Scholarship is important and very much appreciated. Thank you to Kamaljeet and Ravinder Khaira for providing this $2,500 gift and inspiring others to give as well! THANK YOU to our generous donors for helping us reach our goal of 5 gifts! Your support to the Department of Psychiatry & Behavioral Sciences is important and very much appreciated. Thank you to Binda Mangat for providing this $2,500.00 gift and inspiring others to give as well! THANK YOU to our generous donors for helping us reach our goal of 10 gifts! Your support to the Department of Psychiatry & Behavioral Sciences is important and very much appreciated. Thank you to Stewart and Ann Teal for providing this $5,000.00 gift and inspiring others to give as well! Thank you! While we didn’t meet our challenge goal together we did make a big difference for the EDAPT Clinic Davida Feder still made their generous gift of $5,000 and your gift was added to that contribution. Thank you for participating in UC Davis Give Day! Thank you! While we didn’t meet our challenge goal together we did make a big difference for the patients in the Department of Psychiatry & Behavioral Sciences and our donor still made their generous gift of $12,000. Thank you for participating in UC Davis Give Day! Thank you! While we didn’t meet our challenge goal together we did make a big difference for the patients in the Department of Psychiatry & Behavioral Sciences and our donor still made their generous gift of $15,000 and your gift was added to that contribution. Thank you for participating in UC Davis Give Day! Thank you! While we didn’t meet our challenge goal together we did make a big difference for the patients in the Department of Psychiatry & Behavioral Sciences. Tony Quinn still made their generous gift of $20,000. Thank you for participating in UC Davis Give Day! THANK YOU to our generous donors for helping us reach our goal of 15 gifts! Your support to the Behavioral Health Center of Excellence is important and very much appreciated. Thank you to One Mind for providing this $15,900.00 gift and inspiring others to give as well! THANK YOU to our generous donors for helping us reach our goal of another 30 gifts! That's 45 gifts so far today. Your support for the UC Davis Arboretum and Public Garden is important and very much appreciated. Thank you to the Mars Advanced Research Institute for providing this $10,000 challenge gift and inspiring others to give as well! Thank you! While we didn’t meet our challenge goal together we did make a big difference for the Arboretum. Mars Advanced Research Institute (MARI) still made their generous gift of $10,000. Thank you for participating in UC Davis Give Day! THANK YOU to our generous donors for helping us reach our goal of 50 gifts! Your support of UC Davis Women's Lacrosse is important and very much appreciated. Thank you to Jeff Hofgard for providing this $2,500 gift and inspiring others to give as well! We reached our goal of 10 gifts! Thank you to our donors for your generousity and for unlocking $2,500 from David and Linnea Pearson. We reached our goal of 10 gifts! Thank you to our donors for your generosity and for unlocking $2,500 from Anh Tran. THANK YOU to our generous donors for helping us reach our goal of 10 gifts! Your support for the UC Davis Teaching and Research Winery is important and very much appreciated. Thank you to Tim and Marie Louise Bucher for providing this $5,000 challenge gift and inspiring others to give as well! Support your College to move them up the leader board. A gift of any size will increase their ranking! Help your team win the Give Day Championship! The team with the largest number of donors will win bragging rights for the year and, as an extra bonus, claim the most Aggie Pride! Support your team and help them win today, tomorrow, and as future Aggie Alumni. Go Ags! Support We Are Aggie Pride Today! We hit our goal! The Larkeys send their thanks to the 50 donors who joined them in supporting We Are Aggie Pride. Your support will make a huge difference in the lives of Aggies who need it most. The team with the largest number of donors wins the bragging rights for the year, but we also want you to know the amount of impact you are having on each of our sports this Give Day. Your support helps our teams today, tomorrow, and in the future! Go Ags!